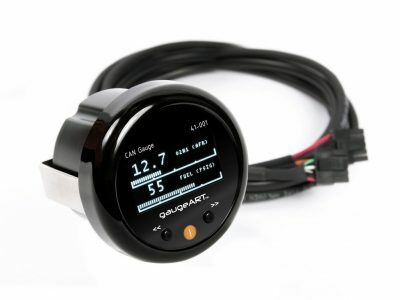 The gaugeART CAN OBD Link allows you to display live real time gauges even if you don’t have an aftermarket ECU! 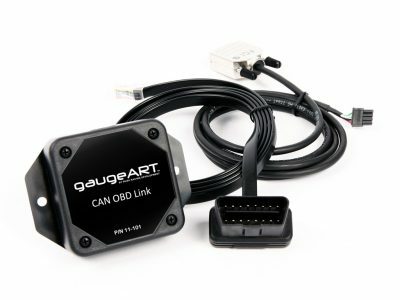 Using a proprietary data transfer system, the gaugeART OBD Link maximizes performance from the OBD port of later model CAN-equipped vehicles (all USA model years 2008 and later as well as some earlier vehicles) to display fast real time gauges. 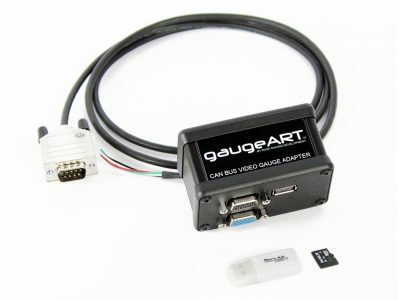 The gaugeART CAN OBD Link allows you to display vibrant full color video gauge designs using the gaugeART Video Gauge Adapter or on a compact OLED gauge using the gaugeART CAN Gauge. In addition, using the gaugeART Analog to CAN Converter, you can display gauges like oil pressure and oil temperature even if your factory vehicle wasn’t equipped with these sensors! Click here for a complete list of supported channels. gaugeART CAN OBD Link requires CAN communication from your vehicle’s OBD port. All 2008 and later vehicles in the USA (as well as most other countries) by federal mandate include CAN communication through the OBD port. Many vehicles starting in 2004 began to adopt this standard. To check if your vehicle sold in the USA prior to 2008 or your vehicle sold outside the USA is compatible with gaugeART CAN OBD Link, please click this link. Click here for support for this product. Follow us online to stay up to date with our news & events. Click here to view gallery of gaugeART product installations.